Pull off outer leaves until you reach leaves that are half yellow, half green. Cut off the end of the stem, leaving about an inch. With a paring knife, cut off the top of the cone and peel the outside to remove the green. With a small spoon, scoop the inside of the ’choke to remove the inedible fur. Immediately place the cleaned artichokes in a small pot of salted water with a squeeze of lemon. Simmer over medium heat until fork-tender. Remove and cut into small pie-shaped pieces and allow to cool. Lightly oil the asparagus and season it with salt and pepper. Place on a hot grill until softened, rotating frequently for even cooking (a little char is a good thing). Cut into 1-inch pieces and let cool. Lightly oil and place on the grill. Allow the entire pepper to char black. Remove from the grill and immediately place into a bowl covered with film wrap and let sit 5 minutes. Remove the film wrap and wipe off the charred skin (do not rinse, or you will lose flavor). Cut the top off and remove the seeds. Dice pepper and let cool. Trim off both ends and remove papery skin. Halve end to end. Lightly oil and season with salt and pepper. Place on a cooking sheet tray in 350-degree oven and roast until fork-tender (a little color is a good thing). Remove from oven and cool. Cut the onion into 1/2-inch pieces. 5. In a bowl, juice the lemons, making sure to discard seeds. Whisk in the minced anchovies, garlic, and olive oil. 6. 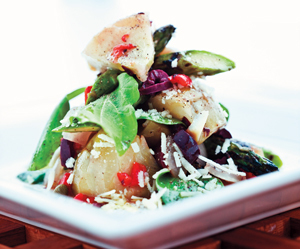 Toss in artichokes, asparagus, sweet onion, roasted pepper, capers, and olives. At this point, the salad may be refrigerated for a couple of days, if needed. 7. Just before serving, add Parmesan and arugula.